The work of the youngsters went on display at Hounslow Library on Thursday December 9 2010, and is expected to be available for people to view for around three weeks. ‘City Living’ was the theme of the project, run by a charity called Plan UK, which works in 48 developing countries to support children. The scheme is run with the help of Shoot Experience, a network of photographers from around then world, and the Riana Development Foundation Network, which promotes community programmed aimed at creating self reliance through work with children in the UK and abroad. Executive director of the Riana Development Foundation Network, Rodgers Orero, got young Hounslow residents involved after his work with local schools. 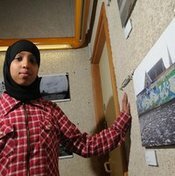 He said: “We have been working with people from less fortunate backgrounds, and have got young people involved in this photography project. “The idea was to get them to express themselves through photography. The photographs were taken on the city streets, it’s great”.